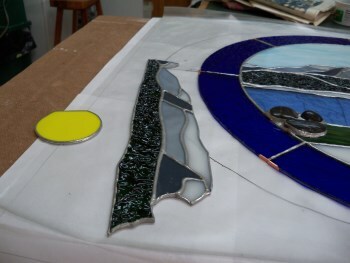 This panel began as an entry for an online contest for the Artisans of Glass website. The contest rules were that the panel needed to have a springtime theme and contain at least one of the following: plating, the inclusion of non-traditional materials, and originality. I felt that I wanted to represent my home state of Maine, and what better than the beautiful Mt. Katahdin, which is also the end of the Appalachian Trail in the United States. Mt. Katahdin is located in Baxter State Park and is a favored hiking mountain. 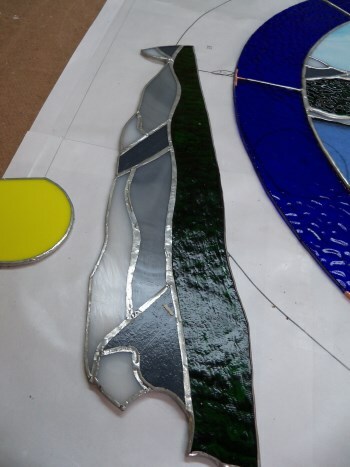 I used Glass Eye 2000 to draw the panel, which contains plating of the mountain range as a reflection in the pond below, plating of the leaves of the tree, smooth river rocks, and decorative solder around the river rock. 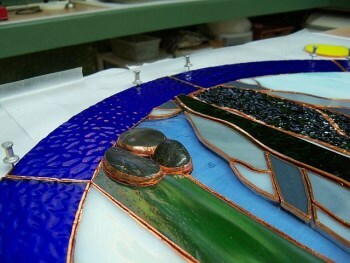 The panel is a 16" round, copper foil piece, with a leaded, sling style frame. Although it was not the first place winner in the contest, I was very pleased with the resulting panel, as was the purchaser of the panel who instantly recognized the location. It is now hanging in the dental office where I work part time and am able to visit it on a regular basis, which I consider a win/win situation. 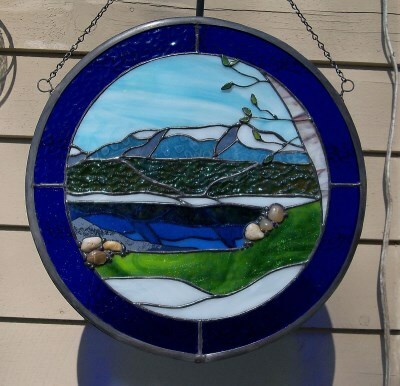 Denise Rogers has been enjoying working with stained glass over 30 years and currently operates a full service studio, Pisces Glass Works, in Cumberland, Maine, where she offers classes, supplies and custom design/commissions. She also designs patterns for a co-owned website, where there are patterns for sale and where custom orders can be placed. She may also be contacted by email.